Distribution and habitat: Adiantum peruvianum is a large, beautiful fern, native to Peru. It is of tropical origin and is quite hardy in cultivation, but requires glasshouse conditions with moderate heat in temperate climates. 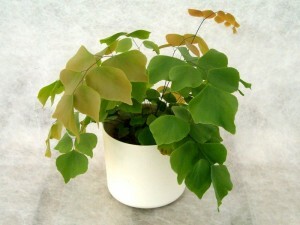 Description: Adiantum peruvianum has black stems and large flat pinnules. New growth is oval shaped and displays a pale pink shade, later turning to pale green with a metallic sheen and finally to a dark green. Spores are produced around the edge of the leaflets. Adiantum peruvianum is a remarkably handsome species, the fronds spread and hang gracefully dependent as the boughs of a weeping willow. Adiantum peruvianum grows to 1m (39 inch) high x 0.8m (31 inch) wide. Houseplant care: When grown indoors, Adiantum peruvianum ferns require filtered light and a constant temperature. Provide a humid environment by placing a pebble filled saucer beneath the pot and filling with water. But remember that Maidenhair ferns do not like to stand in water. In the garden (warm climates) place it in a cool shaded area that is not subject to winds. A humus rich moist soil is best. Light: Shady. The plant typically grows in partial to full shade. Do not expose to any direct sunlight or even especially bright light. Water: Water freely in summer and keep moist in winter. While Adiantum peruvianum needs to be kept moist, do not over water the plant. This can lead to root and stem rot. On the other hand, do not let the Adiantum peruvianum dry out either. In the event it does accidentally dry out, do not be so quick to throw it away. Give it a good soaking and Adiantum peruvianum fern will eventually produce new leaves. Place the pot in a tray of moist pebbles to keep humidity elevated and spray it frequently during the hot months . Temperature: Adiantum peruvianum will do best kept above 21oC (70ºF). Do not expose to cold drafts or temperatures below 15oC (60ºF) if possible. If temperatures fall too low Adiantum peruvianum will likely go dormant, just as it would in the wild. Try to keep Adiantum peruvianum away from areas where temperature fluctuate. Soil: Rich, loose, organic compost. Adiantum peruvianum prefers moist but well-draining soil amended with organic matter, much like in its natural habitat in humus-rich woods. Also grow best in slightly acidic soils. Adding lime rock to potting soil will help increase the acidity of container grown plants. Fertilizer: Adiantum peruvianum trough not greedy, benefit from occasional feeding of standard liquid fertiliser during the growth period (during spring and through to autumn). Feed biweekly with weak liquid fertilizer during growth season. Too much fertilizer causes brown fronds. Potting and Repotting: Annually or biannually, depending on the pot size and growth rate. They don’t mind being a little underpotted, but repot when the roots fill the pot. Divide the plant during repotting to increase the collection. Propagation: By spore or division. Larger plants can be divided during repotting. Uses: Adiantum peruvianum is frequently grown as an ornamental greenhouse or house plant and is favored for its unusually large pinnules. They are an attractive addition to any home or office. Ferns are popular because of their graceful foliage and ability to grow in low light.